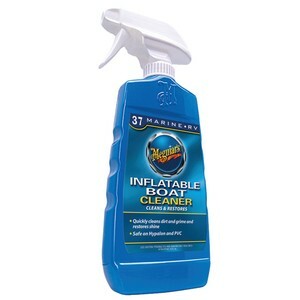 Meguiar's Inflatable Boat Cleaner & Protector keeps your inflatable boat clean and looking brand new by easily removing the dirt and grime. Meguiar's Inflatable Boat Cleaner & Protector keeps your inflatable boat clean and looking brand new by easily removing the dirt and grime. It's environmentally safe and biodegradable formula quickly removes things like dirt, bird droppings, oil, grease, and other stains to make sure your boat stays looking new for the long run. Perfect for rigid inflatable boats, non-rigid inflatable boats, and even kayaks.